So if not Jessica, then who? Catching the thief film-handed, Louis is shocked to find Emery. The usually popular Emery has had trouble as of late. Seems all his male peers have hit capital-P “Puberty,” and now Emery feels emasculated. It’s ok, he’ll write a poem! Trying to save his son embarrassment and/or a beating Louis vows to help Emery “man up.” But buying into toxic masculinity comes at a price. This time being a black eye. Meanwhile, Jessica refuses to sign Eddie’s permission slip (on the grounds that her tax dollars don’t pay for education vacations.) That is, until Honey mentions it’s to Colonial Floridatown. And Jessica is all about Colonial Americans – they’re the Chinese of today! Hardworking, industrious – using every part of the buffalo. Turns out, Jessica’s the fun chaperone, leading Eddie and his friends on a wild day through only the best parts of Colonial Floridatown. Candle-making, black-smithing, midwifery: All the hits. This sets Eddie off, however. He can’t believe it. Jessica is… fun. Jessica. Is. Fun. Where has Fun Mom been for the last decade? Jessica scoffs: Does Eddie really think he’d listen to Fun Mom? Would Fun Mom have kept him clothed and bathed and fed for the last 14 years? Now, that’s when things get really wild. The next morning, Jessica barges into Eddie’s room, screaming for him to get up. But he’s… dressed. And made his lunch (six Oreos and a tortilla.) He heard what she was saying, he internalized it, and he matured a little. It’s an earned moment of growth for Eddie, an organic reveal of a heretofore unseen facet of his personal potential. And Jessica, for her part, openly states how proud she is. They even have time for a quick game of Mario. Worried that he’s given his son bad advice, Louis turns to his own mother for some. Grandma reminds him that while Louis changes himself to fit any situation, Emery can’t be anyone besides who he is. In turn, Louis course-corrects his earlier advice to Emery: Emery’s self-security and self-knowledge is his strength. Those boys at school may be too busy figuring out who they themselves are to realize that now, but that doesn’t mean Emery should have to change himself to fit their mold. And that’s great, because Emery has a poem that he really thinks is gonna prove you don’t need fists to fight. He’s right: The poem is read before the entire class, but it’s Chad’s named signed to the bottom. If you can’t beat em, and you can’t join em, trick the Hell out of them. It’s easy for a sitcom to fall back on lazy proselytizing. The basic theme of “Gotta Be Me” is just that – you gotta be you. 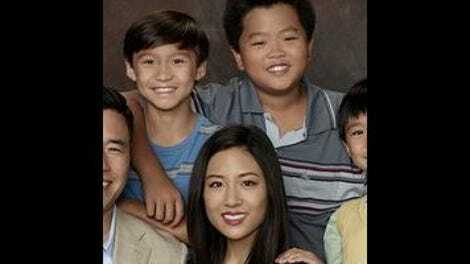 It’s a common saying, both in media and hand-stitched pillows: “Be true to yourself.” But Fresh Off The Boat doesn’t present only one side to the pull-quote. Yes, be true to yourself, but don’t be blind to the way your actions affect others; empathy bred behavioral modifications signal maturity – which, in and of itself, is an exciting new part of one’s personality to discover. The ability to adapt situationally is commendable, but don’t fear owning who you really are. And if who you really are temporarily places a target on your back, it’s ok to camouflage it for the time being. Being “true to yourself” is not as simple as those tchotchkes would have one believe, but Fresh Off The Boat navigates these choppy waters with a calm, steady hand. “God I want to see this.” Louis’s pure lusting for an hilarious, dog-based film. “Criteria and Capers, like French detective films.” Nice save. “Eddie no it’s too early to compete!” But Evan never backs down from a challenge. “Then I’m off to work… like normal!” An amazing song cue on Louis’s frantic search. “I’m not signing another doctor’s note so you can eat two lunches.” Eddie is really great. Why do you guys hate Eddie? Eddie is you, Eddie is me, Eddie is all of us, in a sense. “I got him while he was drinking water. That’s why his tongue is out.” Player’s gonna play, Marvin’s gonna Marv. “Madeline what did I tell you about keeping me in the loop?” A beleaguered principal after my own heart. “If you work out, everything else will.” More Bamford, more of the time! A Minus for that harsh women’s bball burn. Not cool, Grandma!